Background: Decreased levels of vitamin D were associated with increased risk of multiple diseases, including cardiovascular diseases. However, there seem to be some discrepancies among the results obtained from different studies. The aim of the present study was to explore the importance of having sufficient serum levels of vitamin D in reducing the incidence and the progression of coronary artery stenosis and ischemic heart disease (IHD). Methods: Serum levels of vitamin D were measured using radioimmunoassay in 186 Jordanian patients who underwent investigative coronary catheterization. Of these patients, 133 were suffering from coronary artery stenosis. The association between vitamin D levels, coronary stenosis and many risk factors was determined using SPSS software. Results and conclusions: Interestingly, the current results did not show an association between vitamin D abnormalities and the incidence or the reoccurrence of coronary artery stenosis. Moreover, significant differences were detected in the prevalence of vitamin D abnormalities based on the patient’s gender, and there was a significant association between vitamin D abnormalities and both body mass index and dyslipidemia. However, current results did not show any significant association with other risk factors for IHD. For instance, no association was found with smoking, hypertension, diabetes mellitus, stable and unstable angina or with acute recent myocardial infarction. Previous studies have shown accumulating evidence on the association between vitamin D deficiency and increased incidence of cardiovascular diseases, such as, hypertension,9 left ventricular hypertrophy,12 heart failure,13 peripheral arterial disease14 and myocardial infarction.15 These associations were further strengthened based on the significant association between vitamin D abnormalities and the presence of pathophysiological processes underlying atherosclerosis, for instance, inflammation, abnormal vascular function including increased arterial stiffness, abnormal vascular endothelial reactivity, decreased coronary blood flow and vascular calcification including uremic calcification.16–18 In addition, the causal association between vitamin D abnormalities and the previously mentioned metabolic diseases can further strengthen this notion. However, controversies do exist between studies conducted in different countries and under different clinical conditions. The present study aimed at assessing the association between the serum levels of vitamin D and the incidence or reoccurrence of coronary artery restenosis following catheterization and stent implantation in Jordanian adult patients with ischemic heart disease (IHD). Current results could help defining a clinical paradigm for the prevention of atherosclerotic stenosis in patients with coronary artery disease. The study was a single-center, crossover, observational study that was conducted in tertiary health care level settings after receiving the proper approval from the institutional review board at King Abdullah University Hospital in Jordan. All participants in this study provided written informed consent. A total of 186 patients were subjected to the study between September 2014 and December 2015. Those patients were identified by having investigative/diagnostic catheterization for the exclusion of significant coronary artery disease (CAD) before non-coronary cardiac surgeries as a result of having an indication of developing IHD after thrombolysis in myocardial infarction (TIMI) score evaluation. This was done even if they had asymptomatic condition, suspected to have acute coronary syndrome, positive exercise stress test or contraindications to obtain exercise stress test, uninterpretable stress test results, suspected coronary anomalies or congenital heart disease. Concomitantly, those patients were further categorized under two different subgroups; the first group comprised 133 patients who were found to have significant artery stenosis and accordingly received a stent implantation (DESyne® Novolimustm-eluting coronary stent system, cobalt chromium platform, Elixir Medical Corporate, Milpitas, CA, USA). The second group comprised 53 age- and gender-matched subjects with normal (apparently healthy) coronary arteries, which was considered as the control group for the study. The exclusion criteria, for this study, included: severe valve disease, liver or kidney failure, diseases related to bone metabolism, primary or secondary hyperparathyroidism, use of drugs affecting calcium metabolism, history of malignancy or osteoporosis. Demographic and clinical properties were recorded, and blood samples were obtained for biochemical and vitamin D (25[OH] D) analyses. Blood samples were collected at the morning of the catheterization procedure and after overnight fasting. Levels of total cholesterol, high-density lipoprotein cholesterol and triglycerides in serum were measured using an Abbott Aeroset autoanalyzer with original kits (Abbott Laboratories, Abbott Park, IL, USA). Low-density lipoprotein cholesterol levels were calculated using Friedewald equation. A radioimmunoassay procedure was used to measure vitamin D (25[OH] D) levels (DiaSorin, Stillwater, MN, USA). The intra- and inter-assay coefficients of variations (CVs) were 3% and 3.3%, respectively. According to the serum levels of vitamin D, patients were categorized into three subgroups; patients with vitamin D deficiency (vitamin D level of <20 ng/mL), patients with vitamin D insufficiency (vitamin D level of 20–30 ng/mL) and patients with normal levels of vitamin D (vitamin D level of >30 ng/mL). High-sensitivity C-reactive protein level was determined by immuno-turbidimetric method (Abbott Aeroset 1600, Abbott reagents; Abbott Laboratories). Serum uric acid levels were measured using an enzymatic colorimetric test on a Roche Hitachi 911 Chemistry Analyzer (Hoffman-La Roche Ltd., Basel, Switzerland). Statistical analysis was performed using SPSS software (version 16.0; SPSS, Chicago, IL, USA). 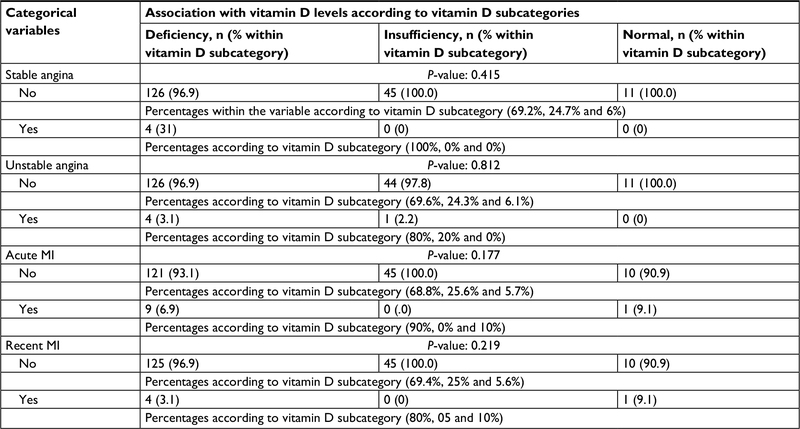 The associations between the categorical variables and vitamin D subcategories were tested using the chi-square test. Independent t-test was performed to compare the mean of vitamin D concentration between the categorical variables. Bivariate Pearson correlation was used to study the association of some continuous variables (age and body mass index [BMI]) with the concentration level of vitamin D. The associations or the differences were considered significant when p-value <0.5. The present study included 186 participants who were initially suspected to have IHD. Their sociodemographic and clinical characteristics were obtained. Alarmingly, most of our patients were not having normal/sufficient levels of vitamin D (94.1%). Of the 94.1% of patients, 69.9% were suffering from vitamin D deficiency, whereas 24.2% were suffering from vitamin D insufficiency. As expected, the number of male patients (n=144) was higher than the number of female patients (n=42), with 3:1 ratio. As well, the ratios for the number of patients who were suffering from vitamin D deficiency compared to the other groups (normal or insufficiency) were 2:1 and 4:1 for males and females, respectively. The percentage of patients with normal vitamin D levels was comparable between both genders (6.3% of male patients and 4.8% of female patients). Yet, the percentage of the patients who were suffering from vitamin D deficiency (compared to the percentage of patients who were suffering from insufficiency) was lower in male patients (66% vs 27.8%, respectively) when compared to female patients (83.3% vs 11.9%, respectively). In general, vitamin D levels were significantly lower in female patients when compared to males (P = 0.036) (Table 1). The association between many atherosclerotic risk factors and vitamin D deficiency or insufficiency was obtained with focus on factors associated with metabolic syndrome (hypertension, DM and dyslipidemia) and smoking. Current findings showed that vitamin D levels were reversely associated with the coincidence of dyslipidemia, where patients who were not complaining of dyslipidemia appeared to suffer from high levels of vitamin D abnormality (P = 0.035). No correlation was found between the coincidence of smoking, hypertension or DM and vitamin D deficiency or insufficiency (P = 0.213, 0.258 and 0.73, respectively). Of interest, there was a significant reverse association between vitamin D concentration/ measurements and the value of the patient’s BMI (P = 0.015). It appeared that patients with lower BMI can have higher levels of vitamin D, regardless of being normal or abnormal levels. No correlation was found between previous incidences of IHD and the subcategory of vitamin D abnormality. However, the number of patients with previous incidences of IHD was very low in the current study (Table 2). According to this study, there was no association between vitamin D levels and the anatomical location of the coronary artery stenosis. Left anterior coronary artery, posterior coronary artery and left circumflex artery were the most affected arteries by coronary stenosis (Table 3). Current results showed no correlation between the levels of vitamin D and the prevalence of coronary stenosis. As well, there was no association between vitamin D levels and the incidence of new coronary stenosis (restenosis) in the same patients after at least 2 years of follow-up, although there was a trend of significant association between vitamin D levels and the incidence of restenosis (0.1> P-value >0.05). 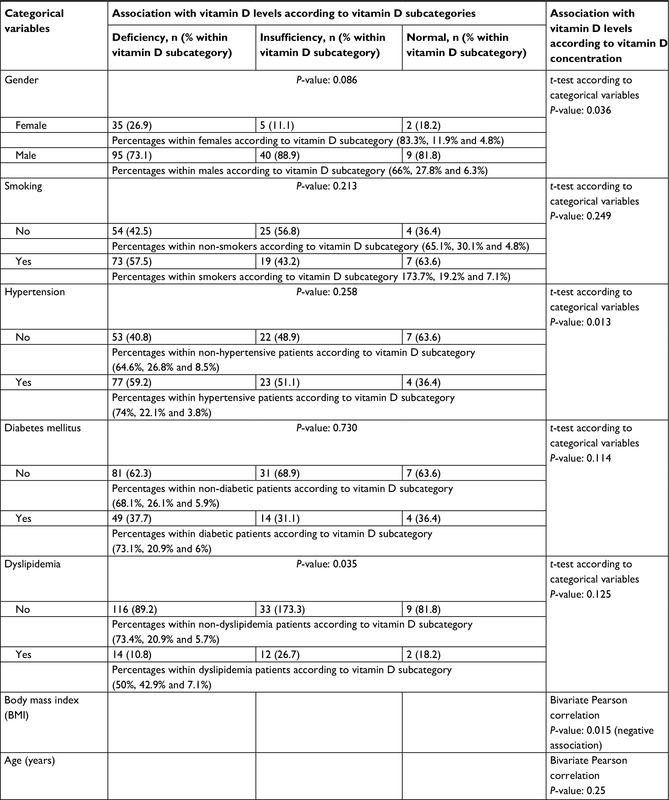 However, the small number of patients who came back for follow-up and who were found to suffer from coronary re-stenosis made us careful about this interpretation (Table 4). Vascular endothelial cells, smooth muscle cells and inflammatory cells can play complementary roles in vascular homeostasis and in the formation and stabilization of atherosclerotic legions.19–21 The presence of vitamin D receptors within the nucleus of these cells can advocate for its integral mechanistic role in the development and progression of ischemic diseases,15,22–24 especially due to the fact that the activation of these receptors has the ability to affect the expression and function of more than 200 genes.15,25 The possible association between vitamin D levels and many ischemic risk factors can strengthen such a notion.3,6–8,25,26 However, similar to other studies,15,22,27 results of the current study did not show significant association between these abnormalities and the incidence or prevalence of IHD. Vitamin D abnormalities are very common and considered the leading cause of supplemental nutrition deficiencies worldwide, especially in elderly.22,28 Reduced exposure to sunlight, gastrointestinal abnormalities, reduced activities and low skin synthesis in elderly22 can greatly predispose for this condition. In Jordan, the prevalence of vitamin D abnormalities was very high in patients with metabolic syndrome, postpartum women, night shift workers, infants and patients with certain diseases.29–32 In agreement with that, the current study showed that most patients were having abnormal levels of vitamin D.
Factors related to the metabolic syndrome,6 such as hypertension,8,9 DM7,26 and dyslipidemia, have been associated with vitamin D abnormalities. In Jordan, previous studies did not show clear associations between vitamin D levels and these factors.29,37 Current study showed that vitamin D abnormalities can be associated in a way or another with some of these risk factors. DM, on the other hand, is another risk factor that can predispose for IHD. Vitamin D abnormalities are thought to be associated with DM by affecting the RAAS system, the calcium cellular concentration and the inflammatory repertoire surrounding the pancreatic cells.48,49 However, in patients with DM, meta-analysis reviews failed to provide consistent evidence on the ability of vitamin D supplementation to modulate the course or progression of prediabetic or diabetic conditions.49–51 Therefore, it was not surprising that we could not detect any association between vitamin D levels and the prevalence of DM in our study. Interestingly, current findings showed that vitamin D levels were reversely associated with the coincidence of dyslipidemia, where patients with dyslipidemia appeared to have better vitamin D subcategorical levels (deficiency vs insufficiency). However, these patients did not have proper and sufficient levels of vitamin D. On the other hand, there was no significant difference between patients with or without dyslipidemia based on vitamin D concentration. These contradictory results can be attributed to the nature of the measured parameters and the statistical analyses that were used, even within the same study. The integral role of cholesterol as a precursor for vitamin D synthesis and the cholesterol integral role in vitamin D proper absorption52 may explain why vitamin D levels may be reduced but cannot be totally deficient in patients with high cholesterol levels (dyslipidemia). Actually, this relationship may explain, in part, why vitamin D deficiency may be of epiphenomenal nature and may not be associated with increased risk of IHD, as more cholesterol, which is a risk for IHD, can be accompanied with better vitamin D levels. Finally, there was a significant reverse association between vitamin D concentration and the value of the patient’s BMI. It appeared that patients with lower BMI can have higher levels of vitamin D, regardless of being normal, insufficient or deficient in vitamin D levels. Part of this reduction may be related to the excessive destruction/deposition of vitamin D in adipose tissue (in patients with high BMI), rather than the BMI increase that was caused by vitamin D abnormalities.53,54 On the other hand, the established association between BMI measurement and different parameters of metabolic syndrome can explain the contradictory results regarding the association between vitamin D levels and these parameters. Hence, reduction in vitamin D levels with increased BMI may give false-positive association between vitamin D abnormalities (reduced levels) and the risk for developing hypertension, DM or IHD. In the current study, the anatomical location of atherosclerotic lesions, which were affecting coronary vessels, was not significantly associated or corresponding with vitamin D subcategorical levels. Previous reports have indications on the ability of vitamin D deficiency to differentially affect the stiffness and functions of the arteries based on their diameter and structure.55–57 However, in the current study, legions at either large or small (bifurcations) coronary vessels were not significantly associated with the changes in vitamin D levels. We could not find a significant indication on the feasibility of using vitamin D levels or the presence of vitamin D deficiency or insufficiency as predictors for the possibility of developing or reoccurring of coronary artery diseases. However, vitamin D abnormalities could be related to IHD or other conditions, which may directly or indirectly affect the progression or prognosis of these diseases; hence, detecting its level and keeping within the normal range is encouraged. Holick MF. The vitamin D deficiency pandemic: approaches for diagnosis, treatment and prevention. Rev Endocr Metab Disord. 2017;18(2):153–165. Wasson LT, Shimbo D, Rubin MR, Shaffer JA, Schwartz JE, Davidson KW. Is vitamin D deficiency a risk factor for ischemic heart disease in patients with established cardiovascular disease? 10-year follow-up of the Nova Scotia Health Survey. Int J Cardiol. 2011;148(3):387–389. Wang H, Chen W, Li D, et al. Vitamin D and chronic diseases. Aging Dis. 2017;8(3):346–353. Haimi M, Kremer R. Vitamin D deficiency/insufficiency from childhood to adulthood: insights from a sunny country. World J Clin Pediatr. 2017;6(1):1–9. Goring H, Koshuchowa S. Vitamin D deficiency in Europeans today and in Viking settlers of Greenland. Biochemistry (Mosc). 2016;81(12):1492–1497. Prasad P, Kochhar A. Interplay of vitamin D and metabolic syndrome: a review. Diabetes Metab Syndr. 2016;10(2):105–112. Mirhosseini N, Vatanparast H, Mazidi M, Kimball SM. The effect of improved serum 25-hydroxyvitamin D status on glycemic control in diabetic patients: a meta-analysis. J Clin Endocrinol Metab. 2017;102(9):3097–3110. Jeong HY, Park KM, Lee MJ, Yang DH, Kim SH, Lee SY. Vitamin D and hypertension. Electrolyte Blood Press. 2017;15(1):1–11. Colotta F, Jansson B, Bonelli F. Modulation of inflammatory and immune responses by vitamin D. J Autoimmun. 2017;85:78–97. Zittermann A, Gummert JF, Borgermann J. The role of vitamin D in dyslipidemia and cardiovascular disease. Curr Pharm Des. 2011;17(9):933–942. Panizo S, Barrio-Vazquez S, Naves-Diaz M, et al. Vitamin D receptor activation, left ventricular hypertrophy and myocardial fibrosis. Nephrol Dial Transplant. 2013;28(11):2735–2744. Meredith AJ, McManus BM. Vitamin D in heart failure. J Card Fail. 2013;19(10):692–711. Chua GT, Chan YC, Cheng SW. Vitamin D status and peripheral arterial disease: evidence so far. Vasc Health Risk Manag. 2011;7:671–675. Huang J, Wang Z, Hu Z, Jiang W, Li B. Association between blood vitamin D and myocardial infarction: a meta-analysis including observational studies. Clin Chim Acta. 2017;471:270–275. Bikle DD. Vitamin D and the skin: physiology and pathophysiology. Rev Endocr Metab Disord. 2012;13(1):3–19. Gallieni M, Cozzolino M, Fallabrino G, Pasho S, Olivi L, Brancaccio D. Vitamin D: physiology and pathophysiology. Int J Artif Organs. 2009;32(2):87–94. Hou YC, Liu WC, Zheng CM, Zheng JQ, Yen TH, Lu KC. Role of vitamin D in uremic vascular calcification. Biomed Res Int. 2017;2017:2803579. Cichon N, Lach D, Dziedzic A, Bijak M, Saluk J. Procesy zapalne w aterogenezie. [The inflammatory processes in atherogenesis]. Polski merkuriusz lekarski: organ Polskiego Towarzystwa Lekarskiego. 2017;42(249):125–128. Polish. Chistiakov DA, Melnichenko AA, Myasoedova VA, Grechko AV, Orekhov AN. Mechanisms of foam cell formation in atherosclerosis. J Mol Med (Berl). 2017;95(11):1153–1165. Wang D, Wang Z, Zhang L, Wang Y. Roles of cells from the arterial vessel wall in atherosclerosis. Mediators Inflamm. 2017;2017:8135934. Milazzo V, De Metrio M, Cosentino N, Marenzi G, Tremoli E. Vitamin D and acute myocardial infarction. World J Cardiol. 2017;9(1):14–20. Somjen D, Weisman Y, Kohen F, et al. 25-Hydroxyvitamin D3-1alpha-hydroxylase is expressed in human vascular smooth muscle cells and is upregulated by parathyroid hormone and estrogenic compounds. Circulation. 2005;111(13):1666–1671. Rahman A, Hershey S, Ahmed S, Nibbelink K, Simpson RU. Heart extracellular matrix gene expression profile in the vitamin D receptor knockout mice. J Steroid Biochem Mol Biol. 2007;103(3–5):416–419. Norman PE, Powell JT. Vitamin D and cardiovascular disease. Circ Res. 2014;114(2):379–393. Poolsup N, Suksomboon N, Plordplong N. Effect of vitamin D supplementation on insulin resistance and glycaemic control in prediabetes: a systematic review and meta-analysis. Diabet Med. 2016;33(3):290–299. Veloudi P, Jones G, Sharman JE. Effectiveness of vitamin D supplementation for cardiovascular health outcomes. Pulse. 2017;4(4):193–207. Wimalawansa SJ, Razzaque DMS, Al-Daghri NM. Calcium and vitamin D in human health: hype or real? J Steroid Biochem Mol Biol. Epub 2017 Dec 16. Alkhatatbeh MJ, Abdul-Razzak KK, Khasawneh LQ, Saadeh NA. High prevalence of vitamin D deficiency and correlation of serum vitamin D with cardiovascular risk in patients with metabolic syndrome. Metab Syndr Relate Disord. 2017;15(5):213–219. Mohammad KI, Kassab M, Shaban I, Creedy DK, Gamble J. Postpartum evaluation of vitamin D among a sample of Jordanian women. J Obstet Gynaecol. 2017;37(2):200–204. Alefishat E, Abu Farha R. Determinants of vitamin D status among Jordanian employees: focus on the night shift effect. Int J Occup Med Environ Health. 2016;29(5):859–870. Kassab M, Shaban I, Mohammad K, Creedy DK. Prevalence of hypovitaminosis D among Jordanian healthy infants: a descriptive cross sectional study. J Pediatr Nurs. 2016;31(2):e119–125. Aleksova A, Belfiore R, Carriere C, et al. 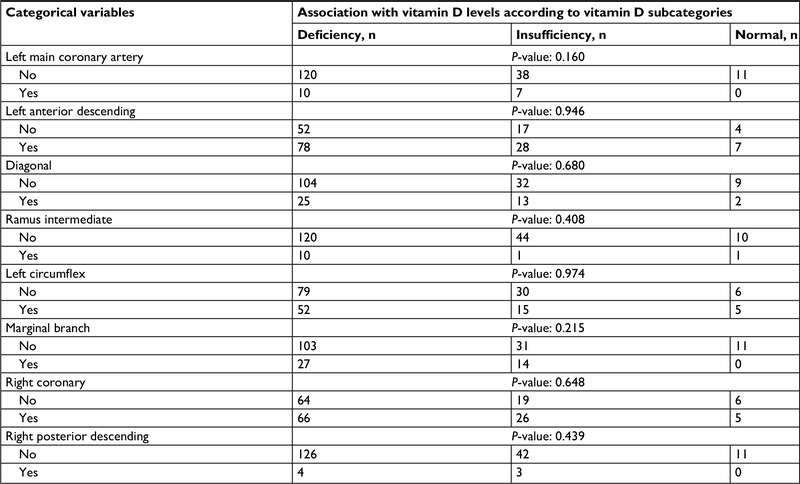 Vitamin D deficiency in patients with acute myocardial infarction: an Italian single-center study. Int J Vitam Nutr Res. 2015;85(1–2):23–30. Chirita-Emandi A, Socolov D, Haivas C, Calapis A, Gheorghiu C, Puiu M. Vitamin D status: a different story in the very young versus the very old Romanian patients. PLoS One. 2015;10(5):e0128010. Niculescu DA, Capatina CAM, Dusceac R, Caragheorgheopol A, Ghemigian A, Poiana C. Seasonal variation of serum vitamin D levels in Romania. Arch Osteoporos. 2017;12(1):113. Batieha A, Khader Y, Jaddou H, et al. Vitamin D status in Jordan: dress style and gender discrepancies. Ann Nutr Metab. 2011;58(1):10–18. Yasein N, Shroukh W, Hijjawi R. Serum vitamin D and the metabolic syndrome among osteoporotic postmenopausal female patients of a family practice clinic in Jordan. Adv Clin Exp Med. 2015;24(2):245–250. Dakshinamurti K. Vitamins and their derivatives in the prevention and treatment of metabolic syndrome diseases (diabetes). Can J Physiol Pharmacol. 2015;93(5):355–362. Vaidya A, Sun B, Larson C, Forman JP, Williams JS. Vitamin D3 therapy corrects the tissue sensitivity to angiotensin ii akin to the action of a converting enzyme inhibitor in obese hypertensives: an interventional study. J Clin Endocrinol Metab. 2012;97(7):2456–2465. Pirro M, Manfredelli MR, Helou RS, et al. Association of parathyroid hormone and 25-OH-vitamin D levels with arterial stiffness in postmenopausal women with vitamin D insufficiency. J Atheroscler Thromb. 2012;19(10):924–931. Lee JI, Oh SJ, Ha WC, et al. Serum 25-hydroxyvitamin D concentration and arterial stiffness among type 2 diabetes. Diabetes Res Clin Pract. 2012;95(1):42–47. Rodriguez AJ, Scott D, Srikanth V, Ebeling P. Effect of vitamin D supplementation on measures of arterial stiffness: a systematic review and meta-analysis of randomized controlled trials. Clin Endocrinol. 2016;84(5):645–657. Stojanovic M, Radenkovic M. Vitamin D versus placebo in improvement of endothelial dysfunction: a meta-analysis of randomized clinical trials. Cardiovasc Ther. 2015;33(3):145–154. Weber KT, Rosenberg EW, Sayre RM. Suberythemal ultraviolet exposure and reduction in blood pressure. Am J Med. 2004;117(4):281–282. Al Mheid I, Quyyumi AA. Vitamin D and cardiovascular disease: controversy unresolved. J Am Coll Cardiol. 2017;70(1):89–100. Ergenekon E, Gucuyener K, Dursun H, et al. 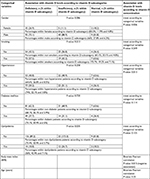 Nitric oxide production in newborns under phototherapy. Nitric Oxide. 2002;6(1):69–72. Buyukafsar K, Levent A, Un I, Ark M, Arikan O, Ozveren E. Mediation of nitric oxide from photosensitive stores in the photorelaxation of the rabbit corpus cavernosum. Eur J Pharmacol. 2003;459(2–3):263–267. Gysemans CA, Cardozo AK, Callewaert H, et al. 1,25-Dihydroxyvitamin D3 modulates expression of chemokines and cytokines in pancreatic islets: implications for prevention of diabetes in nonobese diabetic mice. Endocrinology. 2005;146(4):1956–1964. Santos RKF, Brandao-Lima PN, Tete R, Freire ARS, Pires LV. Vitamin D ratio and glycaemic control in individuals with type 2 diabetes mellitus: a systematic review. Diabetes Metab Res Rev. Epub 2017 Dec 21. Seida JC, Mitri J, Colmers IN, et al. Clinical review: effect of vitamin D3 supplementation on improving glucose homeostasis and preventing diabetes: a systematic review and meta-analysis. J Clin Endocrinol Metab. 2014;99(10):3551–3560. Jamka M, Wozniewicz M, Jeszka J, Mardas M, Bogdanski P, Stelmach-Mardas M. The effect of vitamin D supplementation on insulin and glucose metabolism in overweight and obese individuals: systematic review with meta-analysis. Sci Rep. 2015;5:16142. Huff T, Jialal I. Physiology, cholesterol. In: StatPearls. Treasure Island, FL: StatPearls Publishing; 2017. Borel P, Caillaud D, Cano NJ. Vitamin D bioavailability: state of the art. Crit Rev Food Sci Nutr. 2015;55(9):1193–1205. Manouchehri N, Vakil-Asadollahi M, Zandifar A, Rasmani F, Saadatnia M. Vitamin D status in small vessel and large vessel ischemic stroke patients: a case-control study. Adv Biomed Res. 2017;6:146. Brooks AR, Lelkes PI, Rubanyi GM. Gene expression profiling of vascular endothelial cells exposed to fluid mechanical forces: relevance for focal susceptibility to atherosclerosis. Endothelium. 2004;11(1):45–57. Chiu JJ, Usami S, Chien S. Vascular endothelial responses to altered shear stress: pathologic implications for atherosclerosis. Ann Med. 2009;41(1):19–28. Pradhan AD, Manson JE. Update on the vitamin D and omega-3 trial (VITAL). J Steroid Biochem Mol Biol. 2016;155(Pt B):252–256.